It's no wonder that introversion is making headlines -- half of all Americans are introverts. But if that describes you -- are you making the most of your inner strength? Psychologist and introvert Laurie Helgoe unveils the genius of introversion. Introverts gain energy and power through reflection and solitude. Our culture, however, is geared toward the extrovert. The pressure to get out there and get happier can lead people to think that an inward orientation is a problem instead of an opportunity. Helgoe shows that the exact opposite is true: introverts can capitalize on this inner source of power. 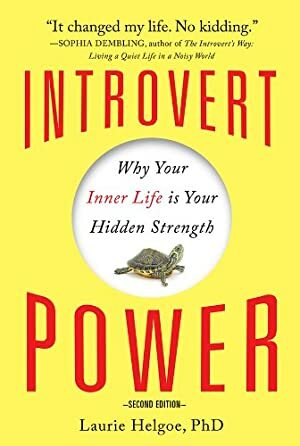 Introvert Power is a blueprint for how introverts can take full advantage of this hidden strength in daily life. Quiet is might. Solitude is strength. Introversion is power. Track It. This book has been $7.19 within the past year. Log In to track Laurie A Helgoe on eReaderIQ. to be notified each time the price drops on any book by Laurie A Helgoe. to stop tracking Laurie A Helgoe. We started tracking this book on April 22, 2013. This book was $10.09 when we started tracking it. The price of this book has changed 133 times in the past 2,189 days. The current price of this book is $10.07 last checked one day ago. This lowest price this book has been offered at in the past year is $7.19. The lowest price to date was $1.99 last reached on November 18, 2015. The highest price to date was $12.18 last reached on September 29, 2015. This book has been $12.18 one time since we started tracking it. We last verified the price of this book about one day ago. At that time, the price was $10.07. This price is subject to change. The price displayed on the Amazon.com website at the time of purchase is the price you will pay for this book. Please confirm the price before making any purchases.